Includes a full review of your Program Description, a site visit,and post-visit report, completed by both a DACLAM Veterinarian, and an operations director, both with decades of AAALAC International experience. Provided by professionals with extensive experience in the care of aquatic species and operation of aquatics facilities. From facility design to selection of housing systems, to care of a wide range of aquatic species, FEFA can assist with the establishment of a new aquatics program, or provide enhancements to existing programs. Provided by professionals with extensive vivarium-specific engineering and architectural experience. Operations directors offer expertise from the perspective of the end user, providing the “lessons learned” insight only attained through first-hand experiences in vivarium design, construction, and selection of capital equipment. Provided by operations directors with decades of experience in programs of all sizes and complexities. From simultaneous oversight of several facilities housing a wide range of species, to husbandry and cage processing for 20,000+ cages, our expertise in achieving efficient, effective operations is unrivaled. From the establishment or refinement of a standard health and safety program, to establishing and enhancing safe practices for the use of hazardous agents, FEFA provides clients with extensive and comprehensive health and safety experience and expertise. FEFA utilizes a Certified Biological Safety Professional (CBSP) with extensive experience in the design and operation of ABSL 1-3 facilities and Select Agents, ensuring that clients receive expert insight on the administration of biological safety programs. Provided by professionals with decades of experience with the most challenging of inbred strains, as well as providing large- scale programmatic colony management services that employ numerous technicians dedicated exclusively to colony management activities. 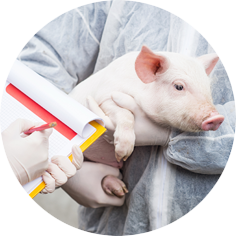 Whether providing on-site training sessions by one of our Training Specialists, or providing training curriculum or programs, our expertise in a wide range laboratory animal science topics will enhancing the skills and competence of your people. Occupational health and safety, regulatory compliance, technical procedures, basic animal care, proper operation of equipment, operational efficiency, and management practices for the vivarium are but a few of our standard training topics. Through our wealth of corporate experience and consulting expertise, FEFA can customize training sessions and content to meet the unique needs of your program.